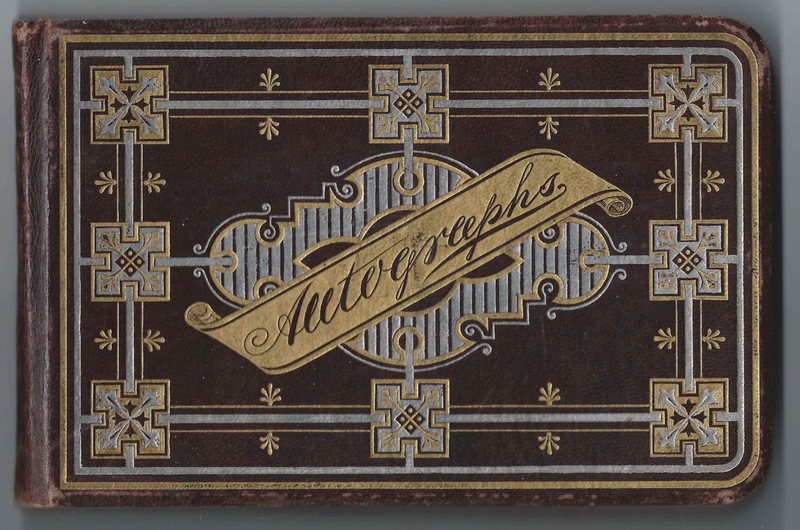 1879-1880s autograph album that belonged to Carrie Parmelia Burbank of Cape Elizabeth, Maine. 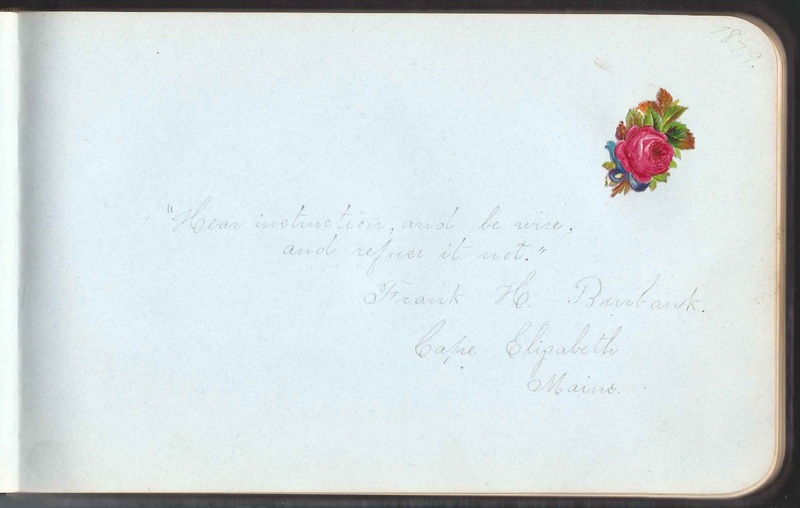 Carrie signed the first page after the title page. The album is approximately 8" x 6" and contains the sentiments of 60 of Carrie's relatives, friends and schoolmates. Many of the signers indicated they were members of the Class of 1880 at Cape Elizabeth High School, as was Carrie herself, presumably. 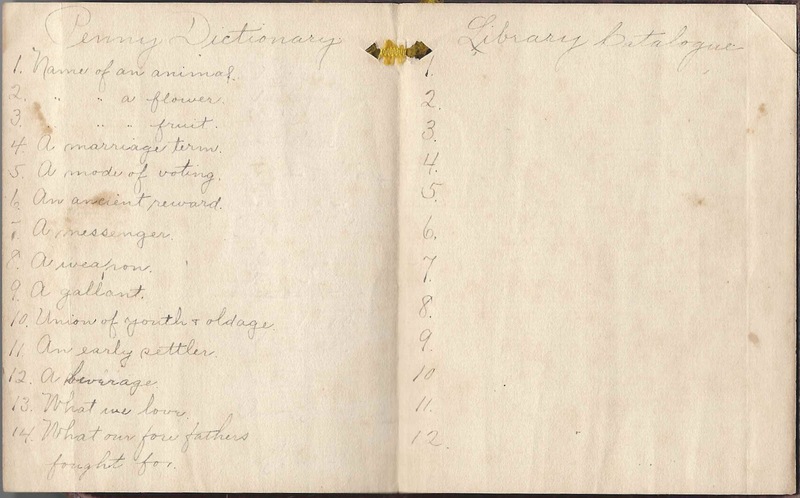 An alphabetical list of the signers appears at the end of this post; if signers indicated their school and class, that information is included in the list. 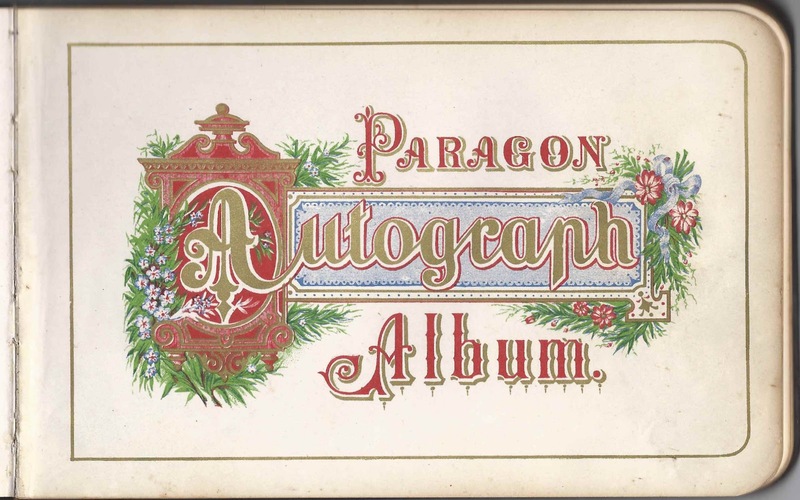 The album contains a trading card for the A. F. Hill Clothing Company of Portland, Maine, and an 1898 Cape Elizabeth program for a Penny Dictionary and Library Catalog, both shown farther below. 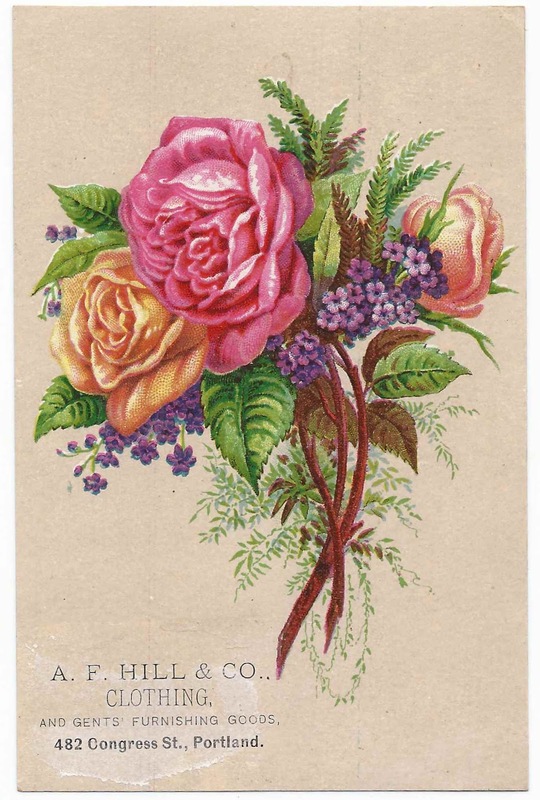 Carrie Parmelia Burbank was born 1 December 1863 at South Portland, Maine, the daughter of Albion and Parmelia W. (Hatch) Burbank, who were born at Denmark, Maine, and South Portland or Cape Elizabeth, Maine, respectively. 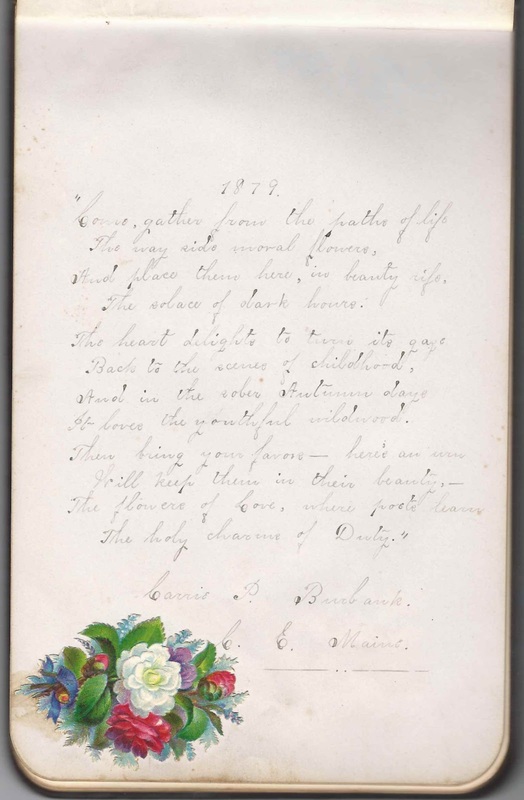 One of the pages in Carrie's album was signed by her mother Parmelia on March 24, 1879. 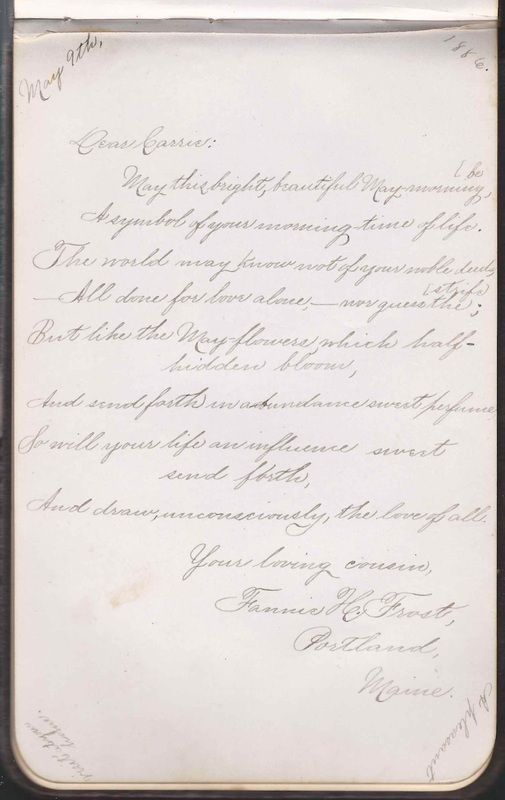 Another signer was Frank H. Burbank, who signed at Cape Elizabeth, Maine, in 1879. He was Franklin H. Burbank, Carrie's older brother. Several people in the album indicated that they were Carrie's cousin. One of these, Fannie H. Frost, was likely related to Carrie through her mother, Parmelia W. (Hatch) Burbank, as Fannie's grandparents were Fred and Emily Hatch. 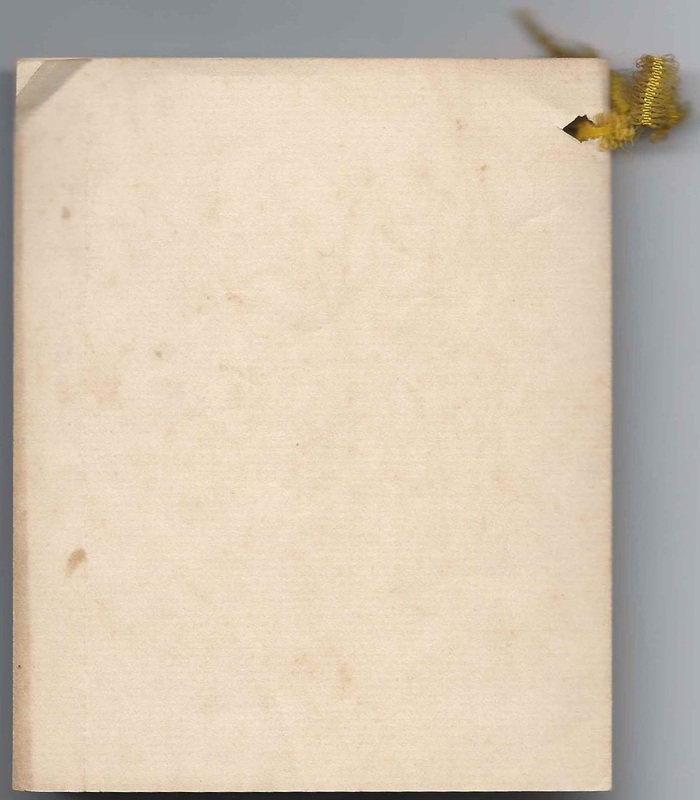 Fannie signed her page at Portland, Maine, on May 9, 1886. On 9 December 1899, Carrie P. Burbank married Everett Wilson Look, son of Charles C. Look and Theresa Amanda (Reynolds) Look. Everett was born December 1859 in Addison, Maine. Carrie's mother had relatives from that area, so perhaps that is how Carrie and Everett met. At the time of his marriage, Everett was a granite polisher. 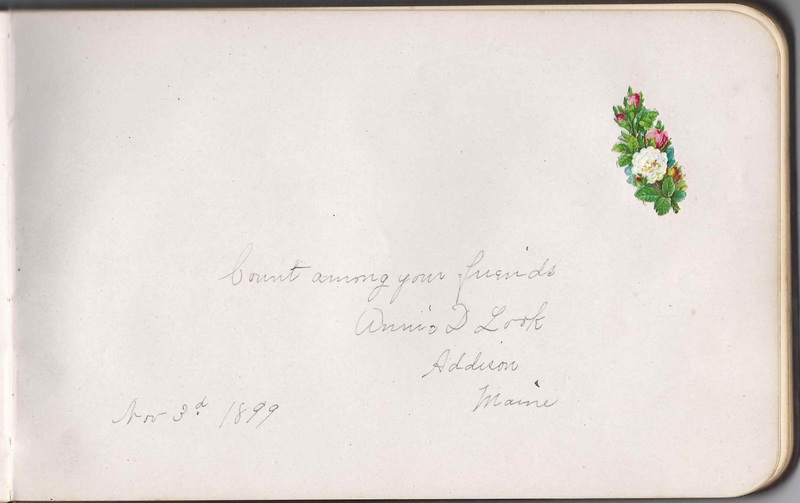 Everett didn't sign a page in the album, but his sister Annie D. Look of Addison did, on November 3, 1899, the latest date an autograph was signed, and just before Carrie's marriage to Everett. 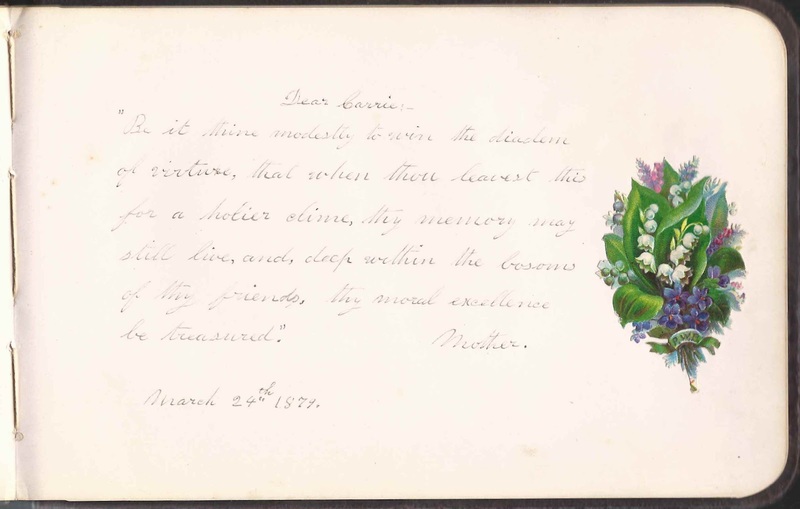 If you have corrections and/or additions to the information above or if you feel that the album owner was a Carrie other than Carrie Parmelia (Burbank) Look, please leave a comment of contact me directly. Please also comment if you have information on any of the signers listed below. Thanks! One page in the album was illustrated. 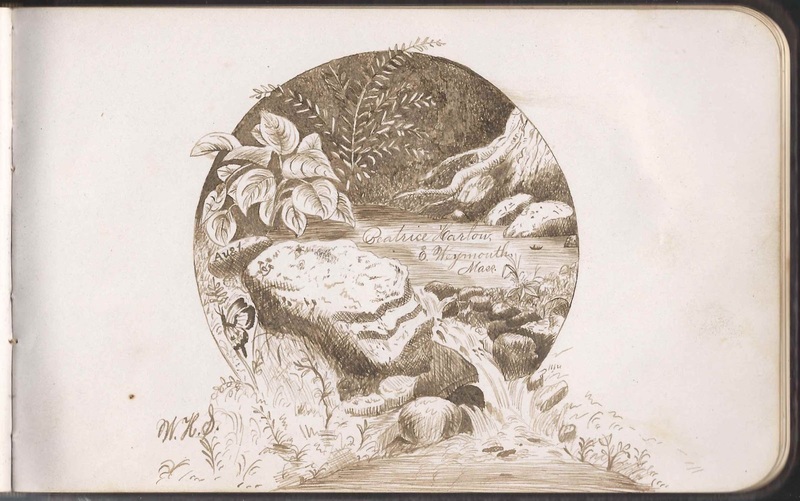 Because it's the only one, I believe that it was hand sketched beautifully by signer Beatrice Harlow of East Weymouth, Massachusetts, who was a student at W.H.S., presumably Weymouth High School. It's also possible that W.H.S. stands for the initials of the person who sketched the design for Beatrice. Or it's possible that the design was preprinted. Howard E. Burbank of Point Village, Maine, signed on April 23, 1882. Point Village is located in Cape Elizabeth, Maine; son of Gideon Hatch Burbank, a brother to Carrie's father Asa Burbank. Fannie H. Frost of Portland, Maine, signed on May 9, 1886; Carrie's cousin who was a granddaughter of Fred and Emily Hatch. Albert Smith of Point Village, Maine, signed on February 4, 1883. Point Village is in Cape Elizabeth, Maine. 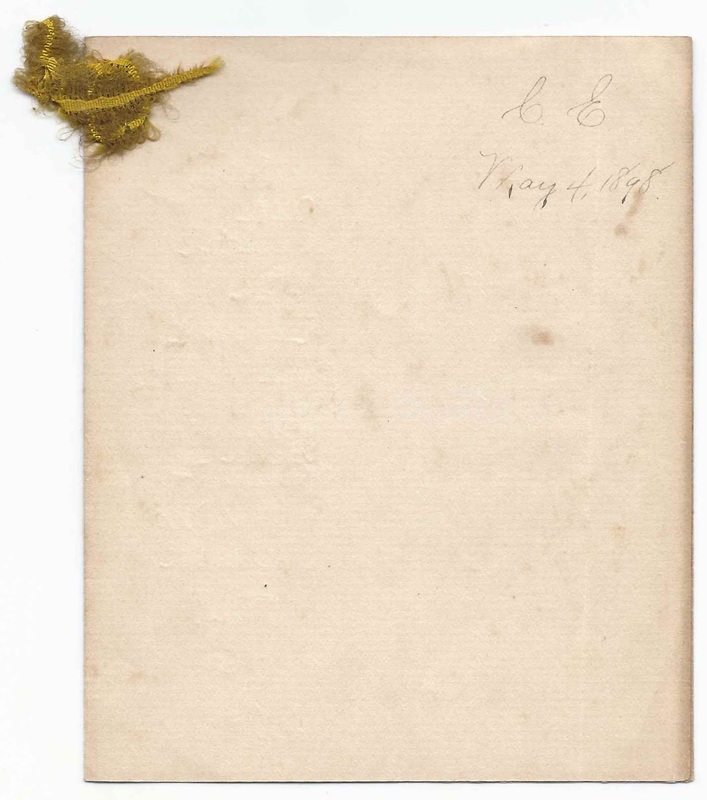 Willis F. Strout of Point Village, Maine, signed on February 4, 1883. Point Village is in Cape Elizabeth, Maine.